Since human civilization began, all peoples, all over the globe have found a way to communicate through music. Music and sound vibration affect our mood, our perception, and even our very cells. Today, modern medicine uses sound vibration to help speed the healing process of bone fractures, and sonic medicine is being explored as a tool for vascular and neurological treatment. 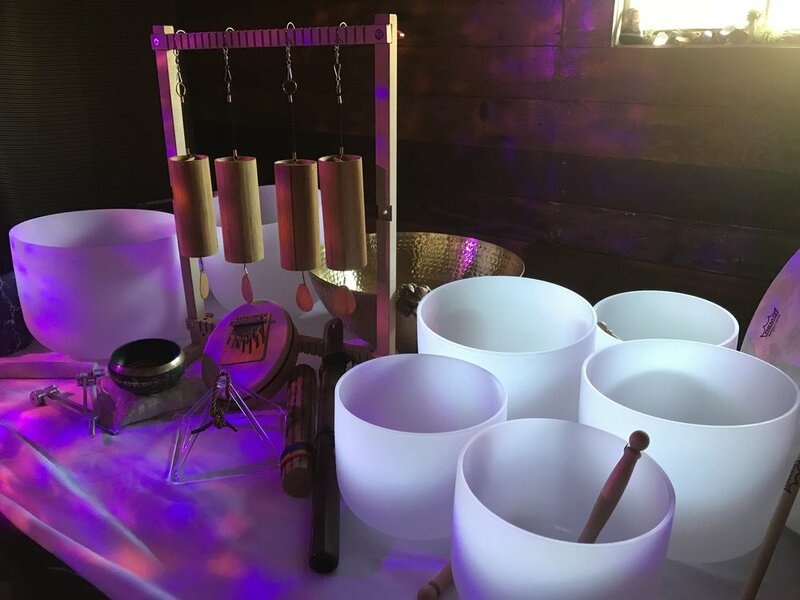 I am pleased to be able to offer a variety of powerful healing sounds to assist in physical healing, creative inspiration, and personal transformation. My clinic is equipped with seven 99.99 % pure quartz crystal bowls, tuned to the 432 hz frequency, that are played in sequence beneath you, one for each area of the body or chakra, as you rest comfortably on the heated acupuncture table. Additional instruments may be added at your request, including the shamanic rhythms of the buffalo drum, chimes, spirit flute, tibetan brass bowls, the enchanting sansula and koshi chimes, the hypnotic drone of the Vietnamese monochord, the deep rumble of the thunder drum and chinese gong, and the subtle vibration of tuning forks applied directly to the body. Sound vibrations make patterns in both water and dust. We are made of both. Sessions can be deeply moving, and assist in breaking negative patterns. They are especially helpful during times of transition or when profound shifts are desired. 30 minute private sessions may be booked independently of acupuncture for 60 dollars, or combined with acupuncture for 20. Sessions may be added to birth or end of life doula work, or performed for a group at your location. Please inquire for availability and pricing.